Peavey Classic 30 Review – Awesome Combo for Blues, Jazz and Rock! While Peavey is a big name in hard-hitting rock and metal amplifiers, they have a softer side too – illustrated well by the Classic 30. It’s not too expensive, built like a tank and is incredibly versatile. Just a few reasons why this popular little combo tube amp has featured in both our chart of the best jazz amplifiers and best blues amplifiers. Let’s take a closer look! The controls are mounted on the top of the amp (on a chrome-plated panel no less) and comprise a pretty standard lineup that makes the Classic 30 easy to get to grips with. Working from left to right, you’ll find your regular volume control, as well as pre and post gain controls for the lead channel. Next is your reverb rotary, before your bass, middle and treble controls. This panel also features a channel select switch, boost switch, and I/O for the effects loop. No nonsense here! They say never to judge a book by its cover, but the first impressions of the Classic 30 combo are great. It features a cool vintage tweed design making it one of the best-looking in its category, as well as being a robust little amp – certainly one that is comfortable on the road. You’ll find it is just as rugged under the hood, with a steel cage protecting the seven tubes – three 12AX7s and four EL84s. Combined with the new 12” Celestion Midnight 60 speaker, this baby is loud, offering 30 watts of power, which is more than enough to play smaller gigs with (although it offers an additional output for an extension speaker cabinet). There is also built-in genuine spring reverb, which is naturally a great addition for surf rock, should that style pique your interest. As we’ve mentioned, this is a versatile amp, with a wide range of tones to deliver great flexibility. Its clean channels offer an organic and responsive tone that oozes warmth, and has more than enough headroom to keep its clarity, making it a very viable option for jazz guitarists. Even played clean, it cuts through a mix of other guitars, pianos and even drums. Of course, you can easily find good growly overdrive that also makes it an ideal blues amp. How heavy can it go? Probably further than you’d expect. Heavier overdriven rock is no problem through the dirty channel and you can certainly squeeze some classic heavy metal tones too, although if metal is your prime genre, there are much better Peavey amps out there for that. From jazz and country, to surf rock and blues, to heavy metal (…just about), the Classic 30 covers most genres with relative ease. There are better amps for heavier styles, but if you’re looking for a sweet clean sound with great versatility – not to mention reliability – this is a very smart choice. 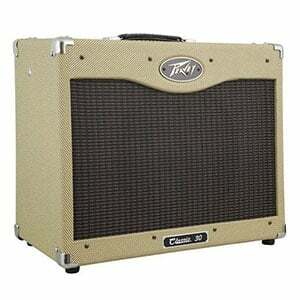 For more info about the Peavey Classic 30, click here. For more Jazz Amplifiers you might like, click here.